I've had these cake toppers in my head since taking down the Christmas tree several weeks ago. I have this vintage bird ornament that is kind of falling apart, and while looking it over to try and repair it, these little guys popped into my head. I missed the window for Poesy's birthday, but who needs a birthday to bake a cake and stick birds on top? NOT ME. The steps for the birds are SO simple. 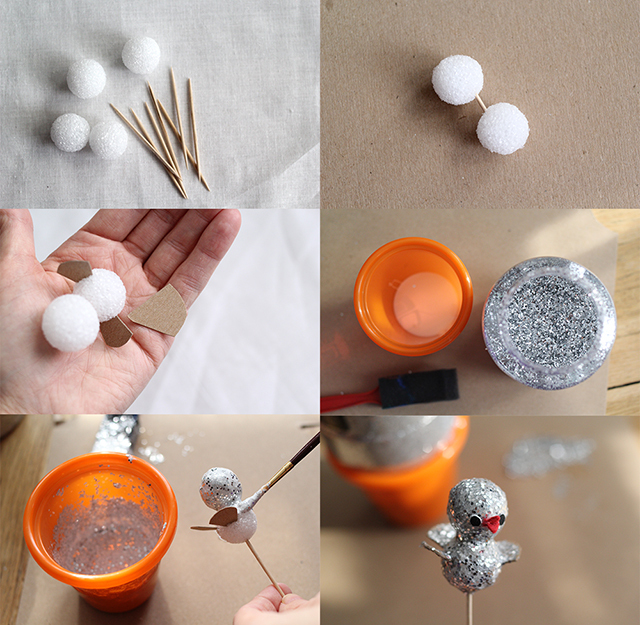 Break a toothpick and stick the ends into two small styrofoam balls (if you don't use styrofoam you could do this with clay). Clip some thin cardboard for wings and a tail, and then insert those into the bird body. Mix Elmer's glue, ModPodge, Tacky Glue, etc. (whatever you have on hand) with glitter to make glitter soup. If your concoction is to thick, you can dilute it with water. Paint the glitter glue onto your bird generously. I added fabric circles and a felt beak once the glue was mostly dry. The girls loved the baking part, of course. 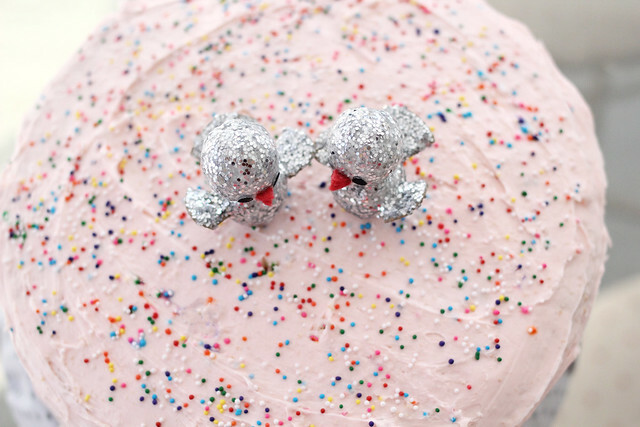 Once the cake cooled I iced it and stuck those birdies right on top. It made for some excited giggles and squeals. It's not everyday you get to have a fancy cake for no reason! 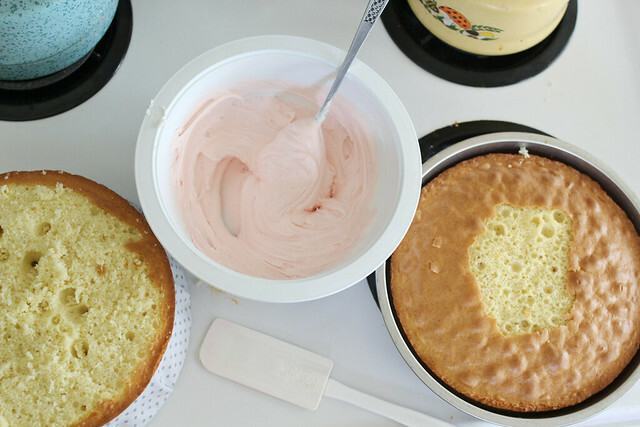 I can see a lot more just-for-fun cakes in our future! Love love love your apron!! 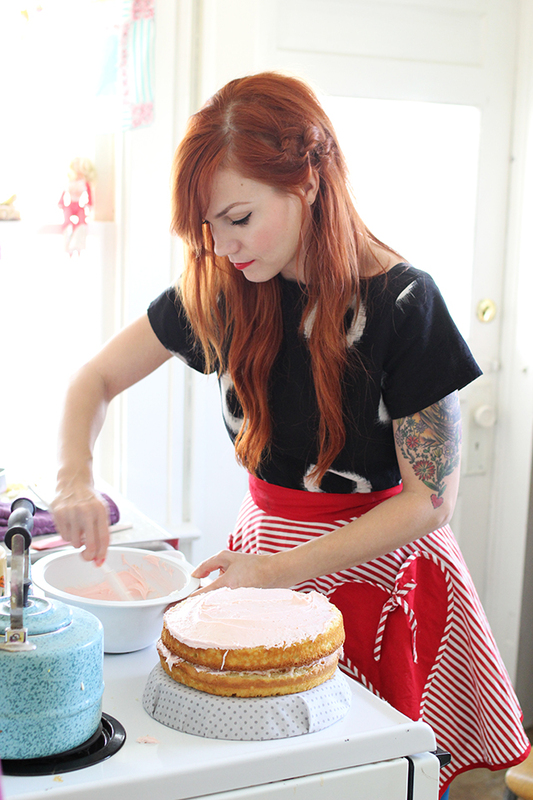 where did you get those red striped aprons? they are so cute! your cake is really cute too. i think like a lovebird type theme would be super cute! i just might have to try this! Just for fun cakes are the best kind of cakes! this is such an adorable and easy idea! 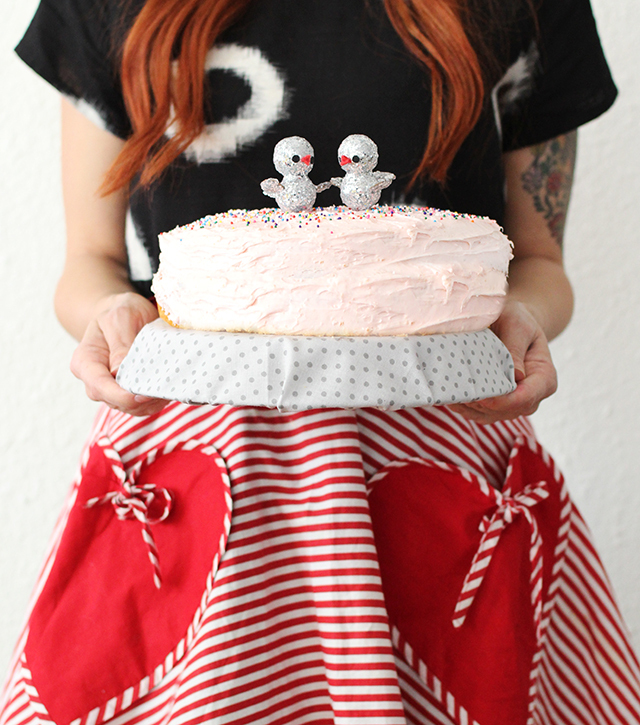 love it =) and just for fun cakes are the best! 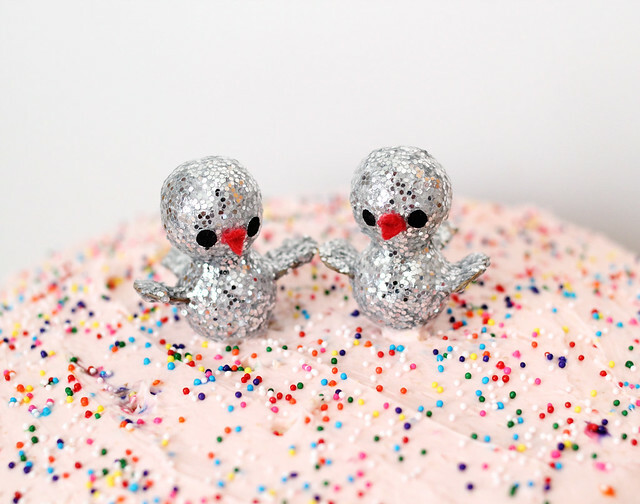 I love these cute little bird toppers! They turned out really great! what a fun treat for the girls! 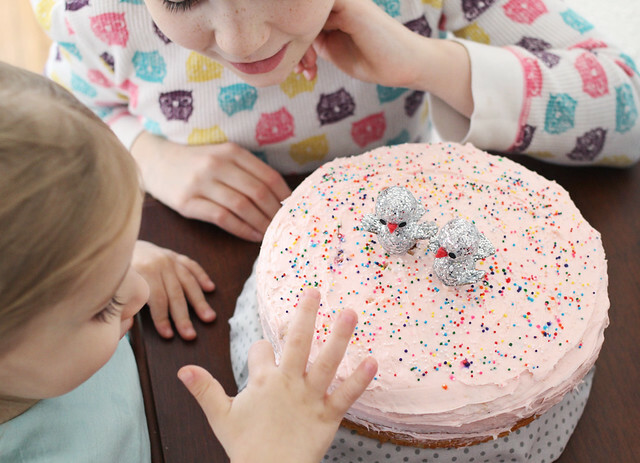 i love that pale pink frosting with the sprinkles. and those birds- i am definitely making! So cute! Those toppers are adorable. I love that the girls helped with the baking! what a cute cake!! and hope's freckles are adorable! so adorable, such a cute idea! love those! Just in time for Valentine's Day too. Just might have to find time to make them! Can you buy that apron online anywhere? I saw on your IG that it was a gift. It's exactly what I've been wanting for myself! I never find anything that cute online. 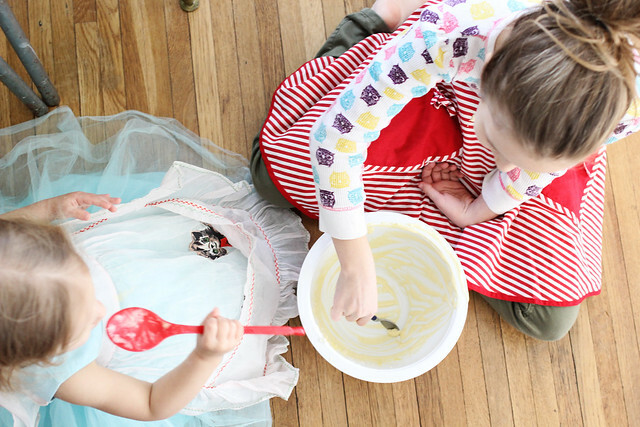 Baking with your girls is the cutest thing ever. 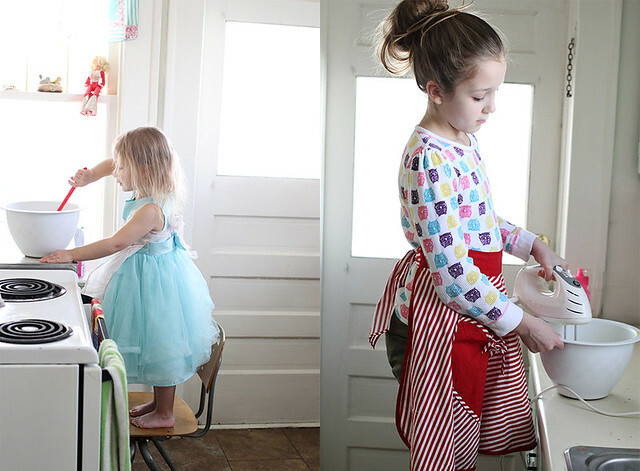 Especially that they're wearing aprons and fairy skirts! So whimsical. Your hair is also stellar - is that the chain braid from ABM? I love the birdie toppers! And with glitter! What a simple, adorable idea. I miss baking - no oven right Noe in my new place in Taiwan. It's a a serious issue! Haha. That is so adorable. I need to make those. i adore the way you enjoy little things with your family! TOO cute. I love all the outfits in this post!